We Be Reading: Get Ready! 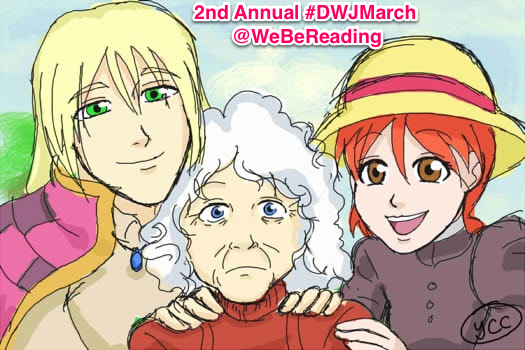 DWJ March is Coming! Get Ready! DWJ March is Coming! 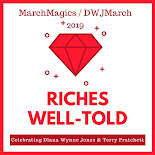 Diana Wynne Jones March is happening! And, according to my survey, most of you wanted guest posts, giveaways and a read-along. So, I'm here to ask for some help in the survey below. Second, we need to choose a Read-Along book. I have a couple of ideas but will give you a write-in option too. There have been read-alongs semi-recently of Fire and Hemlock and Dogsbody so those are probably off the table for this year. I'll announce the read-along book by Feb. 24th so everyone has time to get a copy of whichever book it is. And finally, if you might be interested in hosting a giveaway on your blog for this event, let me know. I have two or three ideas for giveaways that I want to host but I would love to see more DWJ love-sharing out there! Yay! I'm excited. I'll have to decide which books to try out this year. I'm still deciding too. I might finally read the Dalemark books or just reread some favorites. Well in THAT case my post might just have to consist of "why everyone should read the Dalemark books NOW." OK, C&C is not my all-time favorite, but The Crown of Dalemark pretty much is. It is super and fantastic. The other ones are good too. I think I forgot to put a title in. I don't care much what we read, actually--I love 'em all. I would love to do a blog post, but the trouble is that the more I love a book the less I can find to say about it that isn't totally idiotic. DWJ of course reduces me to utter babbling. However, I am happy to try! I don't care much either. I just wanted to see if anyone else did. :) And the reason I want guest posts is because I'm the same way. I'm sure your post will be awesome as long as it's full of love! Thanks for doing this again, Kristen! Looking forward to it. Yay hooray hooray! I'm going to read Changeover and it's going to be maaaaaaaaaaagical. It's so awesome to still have something new to read! Yay! Count me in! I still haven't read my first DWJ books yet. So glad you're joining in! You're in for a treat. Such a great idea! I'm hoping to participate in the readalong - it sounds like it will be fun! I'll announce it this weekend, I think. Thanks for spreading the word about the event! I tried to reply last night on my phone and for some reason I can't remember now, it wouldn't post. So I'm pretty sure I filled out the form, but get back to me (kerryATcreationsDOTcoDOTnz) if it didn't come through. I suggested Eight Days of Luke or Archer's Goon for the read along as they are both favourites. Archer's Goon is a good one for readers to particularly enjoy I think. I'll be reading at least Power of Three in March now you've reminded me, as that's where I'm up to in my Author Read. The form worked. :) I think just about any book would work as a read-along, even ones further along in series. It's so hard to choose! If it has to do with DWJ, count me in! I'm always ready to spread the Wynne Jones love. I'm going to go with Archer's Goon for my read-along vote. Awesome. :) I am so glad I started this event so that we can all praise DWJ! I'd like to join this year! I missed it last year. One of the Christomanci books might be fun for the read-along- they were books that got my son reading, so I cherish them for that reason - and that they are wonderful magical books, too.